We strive to make available chaplaincy training for individuals who may desire to serve as a chaplain in Fort Bend County and provide continuing education to current chaplains. On Thursday, March 28 – Friday, March 29, 2109, we will conduct the International Conference of Police Chaplains Basic Credential training. The training will be held at Second Baptist Church, West Campus located at 19449 Katy Fwy, Houston, TX 77094. Training will begin at 8:00 am and last until 6:00 pm each day. Breaks and snacks will be made available. Lunch will be on your own. A person who attends all training on both days will be awarded their Basic Chaplain Credentials through the ICPC. As a Chaplains Association, we are committed to providing and pursuing continuing education opportunities to all of our members so that we may provide professional Chaplain services to our partnering agencies. 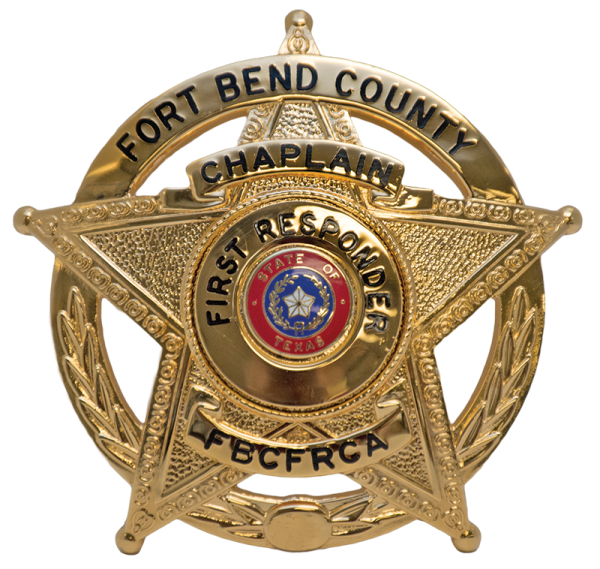 It is our desire to continue to recruit, train and deploy a substantial corps of First Responder Chaplains, properly trained in the necessary disciplines to meet the needs of the Law Enforcement, Fire, Emergency Services and Dispatch Departments in Fort Bend County, Texas. Future training opportunities will be posted on this page.